Single Girl Gourmet: Zuppa Toscana in the instant pot! 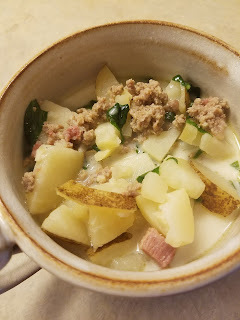 Zuppa Toscana in the instant pot! As someone who doesn't frequent Olive Garden I had never really heard of their zuppa toscana. When I started looking for Instant Pot recipes, I was seeing rave reviews of it all over the place so I thought I'd try it for myself! I made a variation of the recipe from this old gal, and it's amazing! Now I want to go to Olive Garden to try theirs and see how mine compares! I made a few alterations of the recipe I started with of course, I have to make it my own! First, I love pancetta and I often find it easier to cook with than bacon because it already comes cut up into little cubes. I buy it in 4oz packages at Aldi for a little over $2. Especially since the original recipe only called for 4 strips of bacon, I used pancetta instead, I didn't want most of a package of bacon laying around. Or you know, in my stomach. I also just cooked the pancetta with the sausage and left it in because, laziness. I really did not see any reason to take it out and then put it back on top, except maybe it makes a nicer photo op! 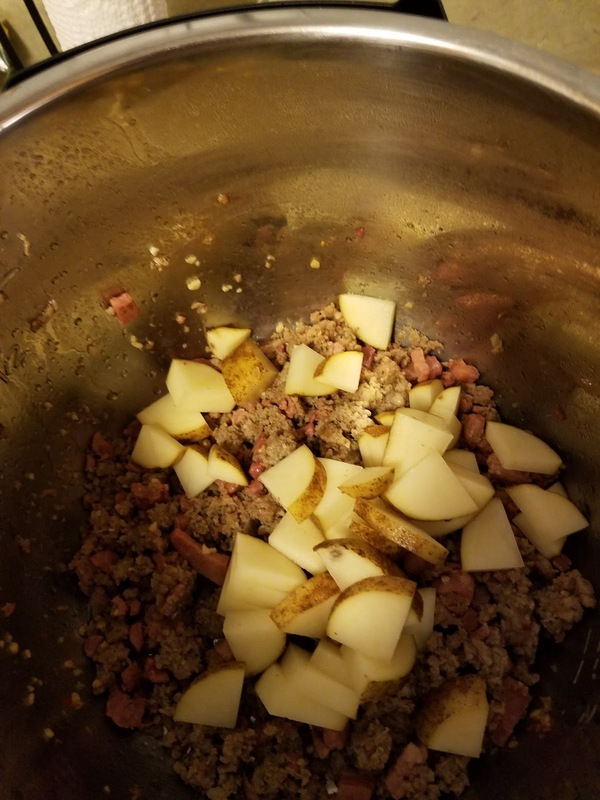 The meat and potatoes in the pot! The other big switch was to use spinach instead of kale. This is an easy swap. I don't like kale very much so I usually will sub spinach for kale. I also don't like onions so I used onion powder. These are just personal preferences. I will definitely be making this soup again, it was so delicious! I had planned to make a big batch to have on hand for the work week but that didn't really work out because we ate so much of it there was barely any left! whoops! Turn your instant pot or other electric pressure cooker on saute normal heat (ie not high or low) and pour a small amount of olive oil in the bottom. Allow to heat for 1-2 minutes and add your garlic sauteing for 2-3 minutes. Add the sausage and pancetta to the pot and brown the meat. When the meat is fully cooked (5-7 minutes) turn the pot off and allow to cool before draining the grease (keep the sausage and pancetta in the pot). 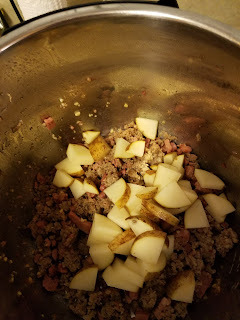 Add the potatoes and chicken stock, a little pepper and onion powder (according to your preference) to the pot and set the pressure cooker to manual and set for 5 minutes. After the cook time finishes allow a 10 minute natural pressure release and then you can release the remaining pressure with quick release (I actually let mine NPR 15 minutes because I was busy, and it still turned out fine). Add the spinach and cream. Stir to combine and allow the spinach to wilt before serving. This post contains some affiliate links. If you make a purchase through these links I will receive a small commission, thank you for your support. Frittata with almond milk! And Paleo friendly.